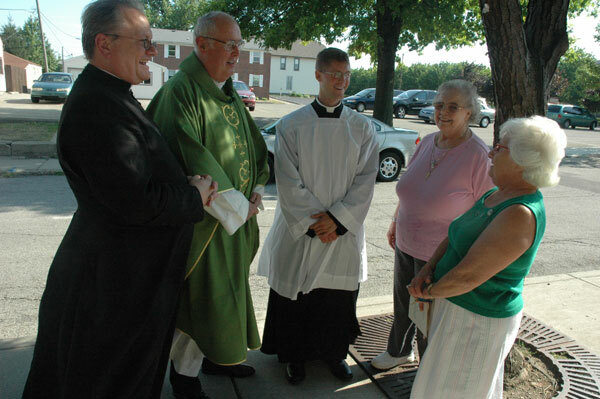 Following the conclusion of a July 14 Mass in English at Our Lady of the Most Holy Rosary Church in Indianapolis, Priestly Fraternity of St. Peter Father Michael Magiera, left, associate pastor of the parish, talks with parishioner Josephine Lombardo, at right. Also present were, second from left, Msgr. Joseph F. Schaedel, pastor of the parish; seminarian Sean Danda and parishioner Mary Jo Buker. On July 7, Pope Benedict XVI issued a motu proprio that allowed for wider celebration of what was termed the Mass of Blessed John XXIII, also known as the Tridentine or traditional Latin Mass. However, archdiocesan director of liturgy Father Patrick Beidelman doesn’t expect any changes to occur at most parishes in central and southern Indiana when the terms of the pope’s apostolic letter take effect on Sept. 14. “For the majority of people in our parishes, the focus is probably going to be the same as it was before—on the practical concerns of the daily life in parishes and with working to make the liturgical life of the communities as vibrant and as effective as they can be,” said Father Beidelman, who also serves as rector of SS. Peter and Paul Cathedral in Indianapolis. Archdiocesan vicar general Msgr. Joseph F. Schaedel thinks that this will be the case in the archdiocese because the traditional Latin Mass has been available for those who prefer it for several years. It has been celebrated on a daily basis at Our Lady of the Most Holy Rosary Church in ­Indianapolis for nine years. And for the past two years, it has been celebrated daily at SS. Cecilia and Philomena Church in Oak Forest in the Batesville Deanery. If that happens, then Holy Rosary Parish might become a model for how two groups of the faithful—one that prefers the Mass in English and the other attached to the traditional Latin Mass—can grow together in faith as a unified parish community. Father Dennis Duvelius was the associate pastor at Holy Rosary Parish for nine years as a member of the Priestly Fraternity of St. Peter, a religious order that focuses on celebrating the traditional Latin Mass. He has since become a priest of the archdiocese and is finishing up his first year as administrator of St. Louis Parish in Batesville.